Jaipur (Rajasthan) [India], Nov.30 : Asserting that the escalations along the border are rising especially after the Nagrota terror attack where seven soldiers lost their lives, Congress leader Shashi Tharoor has urged Prime Minister Narendra Modi to take tangible action instead of making speeches about taking action against terrorists. "I want my government to talk less and act more. We are tired of hearing from our Prime Minster, Defence Minister about their possible retaliations, but despite that soldiers are dying. If you want to retort, then do it by taking any concrete and tangible action, not by talking," Tharoor told media here. New Delhi, Oct 13: The Congress party on Monday relieved Member of Parliament (MP) Shashi Tharoor from his duties as the spokesperson of the organisation. According to reports, the decision was taken after the Congress' Kerala unit complained against Tharoor for praising Prime Minister Narendra Modi. However, accepting the decision, Tharoor said, "As a loyal worker of Congress I accept the decision of the party President to relieve me of my responsibility as a Spokesman." New Delhi, Aug 13 : Former Minister of State for External Affairs Shashi Tharoor, supporting Prime Minister Narendra Modi's "proxy war" statement, said that India always believes in working towards peace. He said that if Pakistan shows any signs of working against terrorism then the two countries would like to walk in the same path. New Delhi, July 14 : Referring to the TRAI (Telecom Regulatory Authority of India) Amendment Bill, former union minister Shashi Tharoor said Monday that the law should not be changed on the basis of an individual's preference, which in this case was the Prime Minister of India. New Delhi, March 22 : Union minister Shashi Tharoor has backed Rahul Gandhi for prime minister, saying people with lesser credentials than the Congress vice president have in the past turned out to be good leaders and Gandhi was the "right alternative" to a "divisive force like Modi". Appearing on the "Right To Be Heard Town Hall election special of Headlines Today, Tharoor was asked why Gandhi and not more educated, more experienced, more knowledgeable leaders were not being projected by the party. New Delhi, Feb 18 : Literacy is more that the ability to read and write and its capacity to empower should never be forgotten, Minister of State for Human Resource Development Shashi Tharoor said Tuesday. "It is important to recognise that literacy is not only the ability to read and write, but is also the exposure to learning of high quality, and enabling of capacity so that it becomes a way towards equal opportunity and empowerment, and improved livelihoods," he said. 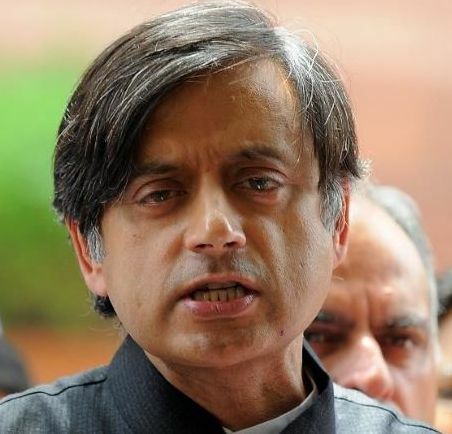 New Delhi, Jan 18 - Shashi Tharoor, minister of state for human resource, was hospitalised after he complained of chest pain early Saturday, a day after his wife Sunanda Pushkar was found dead in a hotel here. Tharoor who was initially admitted to the ICU was later shifted to a ward at the All India Institute of Medical Science (AIIMS). Tharoor is now stable, an AIIMS official said. "Everything is normal. The chest pain was normal now and his condition is stable," AIIMS PRO M. C. Mishra told IANS. New Delhi, Dec 27 : Minister of State for Human Resource Development Shashi Tharoor has been awarded by PETA-India for his contribution to the protection of animals, the animal rights body said Friday. According to the People for the Ethical Treatment of Animals (PETA) India, Tharoor has been instrumental in encouraging the director of the National Council of Educational Research and Training (NCERT) to examine PETA's Central Board of Secondary Education-approved programme for inclusion into its textbooks. New Delhi, Aug 23 : India's biggest competitive advantage over countries like China, US and Japan is its young population, Minister of State for Human Resource Development Shashi Tharoor said Friday. "India has a dynamic, productive and youthful workforce which will be 64 percent of the population by the year 2020, whereas China, US and Japan have ageing labour," said Tharoor at the launch of the Gen Next Workforce Study 2013. By 2020, the average age of the workforce in US would be 40, in Japan 46 and in India it will be just 29, he said. Thiruvananthapuram, June 19 : Union Minister of State for Human Resource Development Shashi Tharoor's latest edited book brings together India's young parliamentarians, cutting across ideologies, geographies and political affiliations. The young men and women who have contributed to 'India: The Future is Now' provide a perspective on a wide range of sectors, ranging from technology to infrastructure, healthcare, education and environmental issues. New Delhi, March 8 : Over 200 BJP women activists Friday stopped Union Minister Shashi Tharoor's car as he was going to attend a function at Talkatora stadium here. The activists were protesting against the lack of safety for women. "Around 12.20 p. m. Tharoor was going to attend the International Women's Day function at Talkatora stadium in central Delhi when his car was stopped by some women BJP Mahila Morcha activists," said a police officer. The activists surrounded the car and shouted slogans. Policemen deployed near the stadium intervened and controlled the situation. New Delhi, Mar 6 : Minister of State for Human Resource and Development (HRD) Shashi Tharoor on Wednesday said the Wharton Business School should have heard Gujarat Chief Minister Narendra Modi after inviting him. Tharoor, however, said that he disagreed with Modi on several issues. New Delhi, Feb 25 : Launching a frontal attack on the ruling Congress Party over Minister of State for Human Resource and Development (HRD) Shashi Tharoor''s remark that the party president or vice-president can be the Prime Minister in 2014, the Bharatiya Janata Party (BJP) on Monday said the UPA Government will not get a third term for the nation is angry on the twin issues of inflation and corruption. Kolkata, Feb 2 : Minister of State for Human Resource Development Shashi Tharoor expressed hope for the proliferating Indian publishing sector saying it is in a "healthy shape". "Publishing on the whole is in a healthy shape in India. Good news is that there is a proliferation of publishers," said Tharoor at the Kolkata Literary Meet here Friday. "Today you are seeing a number of world class publishers in India and a number of Indian publishers who themselves have met international standards of production quality, design quality among others," said the minister. Shashi Tharoor was elected as the Minister of State for External Affairs in May 2009 and in the same year he had won the elections from the Thiruvananthapuram constituency in Kerala. Tharoor has been caught in another controversy where the Comptroller and Auditor General found that he had been hired by the CWG OC, as a consultant between September 2008 and January 2009. He has taken $30,000 as a consultancy fee from the Commonwealth Games Organising Committee and now he is claiming that the payment was much less than what he gets from delivering a single speech.